Udutu Course Authoring is an eLearning course authoring tool which enables users to create interactive, engaging online training content with pre-designed templates, multimedia support, and SCORM compliance, plus PowerPoint upload and HTML5 publishing features. Offering a cloud-based solution, Udutu Course Authoring gives users the flexibility to create and manage online training anywhere, anytime from any desktop, laptop, tablet or mobile device. Pre-designed templates allow users to create engaging course content quickly and efficiently, with interactions, game-like scenarios, and rich media presentations. Users can also add quizzes and assessments to their courses, alongside branching simulations and case-studies. Since Udutu Course Authoring supports multimedia content, users can integrate all major graphic, video and sound formats into their online courses. All courses are SCORM compliant, and integrate directly into any SCORM-compliant learning management system (LMS). To help users get their training online quickly, Udutu Course Authoring allows users to upload and convert their PowerPoint presentations into SCORM-compliant courses. With HTML5 publishing functionality, users can publish basic, advanced and interactive HTML5 templates, ensuring users can access all training content on the move from any internet-enabled device. As a collaborative multi-person, multi-location solution, Udutu Course Authoring aims to enhance course development time and engagement. I came to Udutu with ZERO experience in creating an online course. I'm a retired English teacher and I just wanted a platform to offer some writing instruction for the students I tutor (in other words, I'm a very small fish in a very small pool). At first Uduto was not very intuitive to me, and I felt like the learning curve was steep, but I figure it out enough (within only about 2 weeks) how to make it do what I needed - therefore the simple, free version of the Online Course Authoring tool met my needs and helped me take my project from dream to reality. Yay Udutu. Thanks for you comments Dolly! We appreciate you using Udutu! We've recently added our "Assist U" button to the authoring tool which will have a continually growing number of topics and processes which 'walk' users through the tool/process. Already the feedback is that these are very helpful -particularly for newer users. We also launched an FAQ site (faq.udutu.com) where there's an ever expanding amount of information to be obtained about out tools and services. As with any tool, there is a learning curve but we hope that these two approaches will help users like yourself to get rolling even faster than before! Thanks again! Hi David, Thanks very much for your input and suggestions. The "Retake" issue is something we will look into. As the translated versions of the LMS are limited to the display text at this time, Making a functional text dynamically change for all the language variations may prove difficult to implement. We will certainly look into it and change if possible. A learner view is a good idea. I agree and will suggest it to our development team. Thanks again for using Udutu! Thanks very much for your enthusiastic review Scott! We are so pleased you found our tool(s) and that they are working out for you so well. Please don't hesitate to contact us if any questions come up! Udutu is a robust free authoring tool. Discovered Udutu several years ago when looking for an inexpensive authoring tool for our first online product, a sales skills tool. Being new to the arena, I was most impressed when the CEO, Roger Mundell, spent over an hour on the phone with me answering questions and explaining how Udutu could help us create our learning content. Its biggest advantage for us as newbies is its ease of use and intuitive design. I also like the number of tools it provides to jazz up content. The support is sometimes a bit iffy as it's forum based, but serious issues will get handled personally by senior tech reps and even the CEO. What more can a user ask? Although I'm sure some of the paid software out there would provide even more bells and whistles, we've found Udutu more than adequate for our needs. The fact they continue to offer it free is a huge benefit to small businesses such as ours who are just strrting out in the online learning world. My first experience with Udutu was horrible because our computer system was not compatible with their program. But, since the newest updates that have been made with Udutu; like, where you can now upload your own powerpoint, pictures and make changes are so much easier. I was able to help 5 of my co-workers use this program from start to finish, because of all the new changes that has been made. I am really impressed that this program is offered for free. The customer service is one of the best that I have ever used when it comes to authoring courses. It doesn't matter if I email or call, they are always readily available to help out and teach you how to get the best use out of the program; and make sure your course looks like a course made by professionals. Thanks Sharon! It's been fun seeing you and your team at DOL progress in the use of the tool. Always glad to hear how well it's been working out for you! Contact Udutu Online Learning Solutions for detailed pricing information. Udutu Course Authoring offers a cloud-based solution which allows users to create and manage online training courses from any internet-enabled desktop, laptop, mobile or tablet device. All major video, sound and graphic multimedia formats can be integrated into online courses. Users can add quizzes and assessments, as well as branching simulations and case studies, in order to create engaging course content. All Udutu Course Authoring courses are SCORM compliant, and integrate directly into any SCORM-compliant learning management system (LMS). Multiple people in different locations can collaborate in real time, serving to enhance training development and engagement. Below are some frequently asked questions for Udutu Course Authoring. Q. What type of pricing plans does Udutu Course Authoring offer? Q. Who are the typical users of Udutu Course Authoring? Q. What languages does Udutu Course Authoring support? Q. Does Udutu Course Authoring support mobile devices? Q. Does Udutu Course Authoring offer an API? No, Udutu Course Authoring does not have an API available. Q. What other apps does Udutu Course Authoring integrate with? Q. 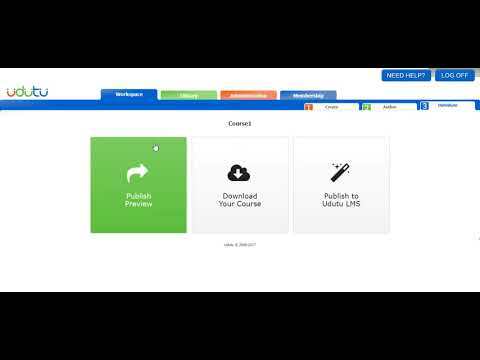 What level of support does Udutu Course Authoring offer?